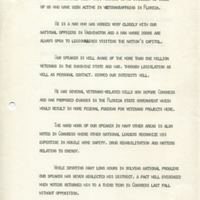 The introduction for Representative Louis Frey, Jr.'s (1934-) speech before the American Legion on June 30, 1973. Rep. Frey served in the U.S. House of Representatives from 1969 to 1979. He was on several committees during his time in office, including the Select Committee on Narcotics Abuse and Control and the Science and Technology Committee. He was also the chairman of the Young Republicans of Florida. During his political career, Rep. Frey tackled several veterans' issues. These issues included World War I veterans' compensation, veterans' education benefits, and pensions. Additionally, Rep. Frey focused his efforts on advancing Central Florida's medical facilities for veterans by introducing several bills into Congress during the 1970s that would have called for the creation of a Veterans' Administration hospital in Brevard County. The American Legion acknowledged these efforts on behalf of veterans during this event. Original transcript, June 30, 1973: Lou Frey Papers, box 11, Lou Frey Institute of Politics & Government, Special Collections and University Archives, University of Central Florida, Orlando, Florida. Digital reproduction of original transcript, June 30, 1973. Our honored guest this morning is no stranger to those of us who have been active in veterans affairs in Florida. He is a man who has worked very closely with our national officers in Washington and a man whose doors are always open to legionnaires visiting the nation's capitol. Our speaker is well aware of the more than one million veterans in the sunshine state and has, through legislation as well as personal contact, served our interests well. He has several veterans-related bills now before Congress and has proposed changes in the Florida state government which would result in more federal funding for veterans projects here. The hard work of our speaker in many other areas is also noted in Congress where other national leaders recognize his expertise in mobile home safety, drug rehabilitation and matters relating to energy. While devoting many long hours in solving national problems our speaker has never neglected his district, a fact well evidenced when voters returned him to a third term in Congress last fall without opposition. 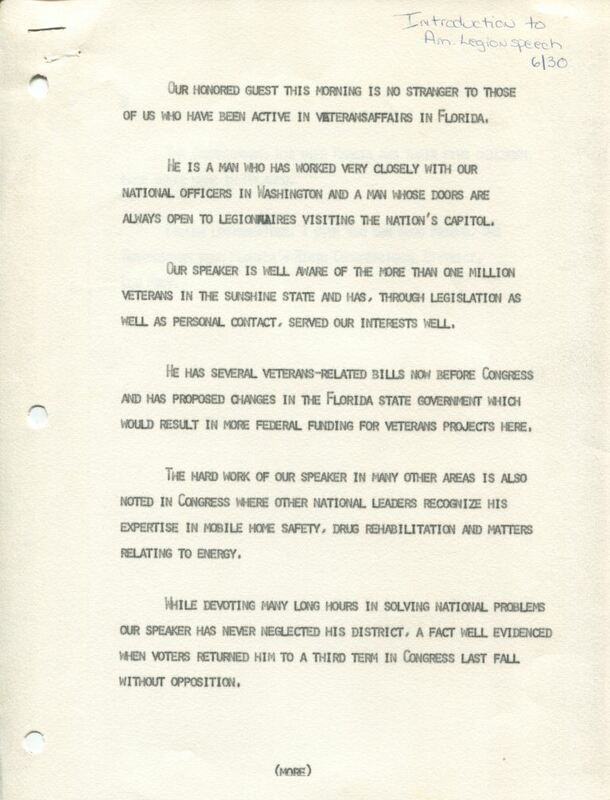 “Introduction for Representative Lou Frey, Jr.'s American Legion Speech.” RICHES of Central Florida accessed April 19, 2019, https://richesmi.cah.ucf.edu/omeka/items/show/3611.